Dulce de membrillo (or just membrillo) is a sweet, sticky, very thick jelly made from the fruit of the quince tree, and is a typical dessert eaten in Spain, although it is also served with toast at the breakfast table. Unlike the jellies we are used to eating in the US, membrillo is dense enough to hold its shape. Dulce de membrillo has a sweet flavor tinged with a bit of sharpness and is similar to guava paste in both appearance and taste. In English, it is known as either quince paste or quince cheese. The quince tree (Cydonia oblonga) is a relative of the apple and the pear and is native to Europe and parts of Asia. Quince can be difficult to find in the US since they are only grown in California. The quince is golden yellow and looks like a large lumpy pear, sometimes with a fuzzy gray exterior. It is not only unattractive, but it is difficult to eat and doesn't taste good raw. When cooked, however, quince release a fruity perfume and change color from pale yellow to deep red. In the same manner as jam, quince paste is made by combining the fruit with sugar and water and cooking at a low heat until it thickens to a gelatin consistency. 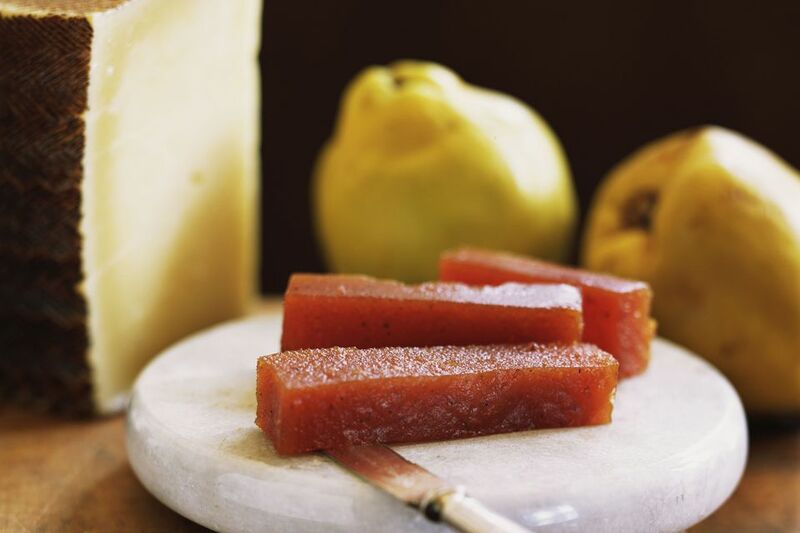 The high amount of natural pectin in the quince creates a paste that is so dense the dulce de membrillo is normally sold in squares or bricks and is sliced before serving. As long as you can get your hands on some quince, it is not difficult to make your own membrillo. In Spain, membrillo is sold in grocery stores and may also be sold in specialty pastry stores. In supermarkets you will find it in a sealed plastic container or in blocks by the kilo — you simply tell the clerk how much you want and they will cut a piece for you. In the US, you can purchase membrillo in jars or cans at gourmet food or ethnic food stores, or over the internet. For a light dessert or breakfast, serve membrillo on top of toast with cheese, called membrillo con queso. Cut the quince paste into thin slices and place over plain toast or toast that's been spread with soft cheese or cream cheese. Some people prefer to serve membrillo with Manchego cheese, creating a salty contrast to the sweetness of the membrillo. Quince paste is also used as a filling for pastry.